This Blogger’s Office set is on sale for $150L this weekend only (so you have a few hours left!) as part of the Spruce Up Your Space event. The set includes most of what you see pictured above (minus the wall painting) and a few pictures I placed on the desk. I desperately needed to update my “home office” even though I rarely actually sit down and use it, I like to pretend I do. Every blogger needs an office!!!! 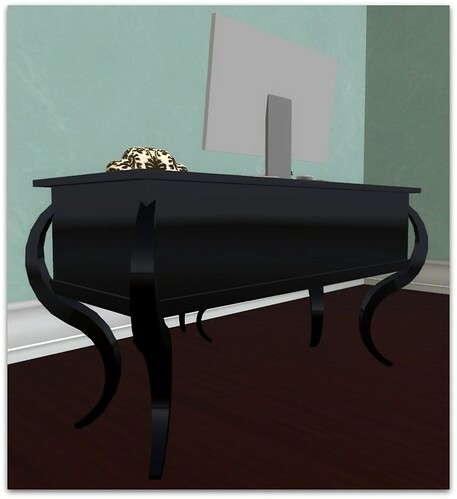 My old one was a desk from La Belle Vie (no longer in SL) that I loved but the desk alone was 24 prims and didn’t really include any matching accessories. The Blogger’s Office set includes this cute laptop, and you can even customize the screen with your own images. I am using one of the images included in this laptop — check it out! It’s WordPress! It was kind of freaky watching SL Gogo use WordPress cos this is a screen that I stare at on a daily basis. The office chair includes some built-in poses for both Male & Female. This is super cute, I’m “thinking” here. I’m curious about all of the art in the room. Did those pieces come w/ the office sets?